The Pharmaceutical Society of Japan, established in 1880, is one of Japan’s oldest and most distinguished academic societies. The Society currently has around 18,000 members. It publishes three monthly scientific journals. Chemical and Pharmaceutical Bulletin (Chem. Pharm. Bull.) began publication in 1953 as Pharmaceutical Bulletin. It covers chemistry fields in the pharmaceutical and health sciences. Biological and Pharmaceutical Bulletin (Biol. Pharm. Bull.) began publication in 1978 as the Journal of Pharmacobio-Dynamics. It covers various biological topics in the pharmaceutical and health sciences. A fourth Society journal, the Journal of Health Science, was merged with Biol. Pharm. Bull. in 2012. Yakugaku Zasshi (Japanese for “Pharmaceutical Science Journal”) has the longest history, with publication beginning in 1881. 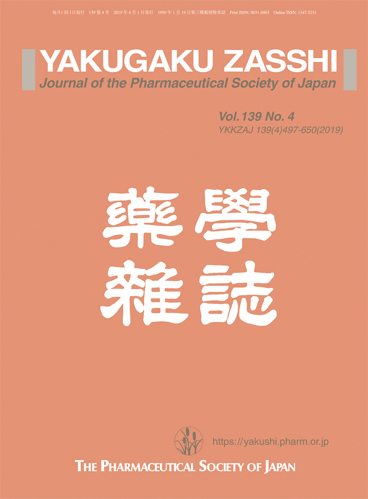 Yakugaku Zasshi is published mostly in Japanese, except for some articles related to clinical pharmacy and pharmaceutical education, which are published in English. The main aim of the Society’s journals is to advance the pharmaceutical sciences with research reports, information exchange, and high-quality discussion. The average review time for articles submitted to the journals is around one month for first decision. The complete texts of all of the Society’s journals can be freely accessed through J-STAGE. The Society’s editorial committee hopes that the content of its journals will be useful to your research, and also invites you to submit your own work to the journals. The combination of dose-adjusted etoposide, prednisone, vincristine, cyclophosphamide and doxorubicin with rituximab (DA-EPOCH-R) is used for non-Hodgkin lymphoma patients. Febrile neutropenia (FN) is a common complication of treatment with myelo-suppressive chemotherapy, so preventing FN is important for maintaining chemotherapy dosage. Recently, pegfilgrastim has been used as the primary prophylaxis of FN in Japan, but there have been few cases reported using pegfilgrastim for the primary prophylaxis in DA-EPOCH-R. In this study, we retrospectively compared the efficacy of pegfilgrastim with that of filgrastim in patients receiving DA-EPOCH-R in Hiroshima University Hospital. Efficacy assessment was based on incidence of FN and serious neutropenia (neutrophil count <500/μL), hospitalization days and chemotherapy dosage level. Ten patients met the inclusion criteria: pegfilgrastim (n=5, 30 cycles) or filgrastim (n=5, 16 cycles). No difference in efficacy existed between pegfilgrastim and filgrastim in the first cycle; however, 2 of 5 patients in filgrastim group reduced dose level in the total cycles of chemotherapy, no patients in pegfilgrastim group reduced. In conclusion, pegfilgrastim seemed better than filgrastim for the primary prophylaxis in DA-EPOCH-R. The combination of dose-adjusted etoposide, prednisone, vincristine, cyclophosphamide and doxorubicin with rituximab (DA-EPOCH-R) is used for treatment of non-Hodgkin lymphoma. Febrile neutropenia (FN) is a common complication of treatment with myelo-suppressive chemotherapy, therefore, preventing FN is important for successful treatment. The authors compared the efficacy of pegfilgrastim with that of filgrastim in patients receiving DA-EPOCH-R and showed that pegfilgrastim seems to be better than filgrastim for the primary prophylaxis, maintaining chemotherapy dosage, and reducing hospital duration.